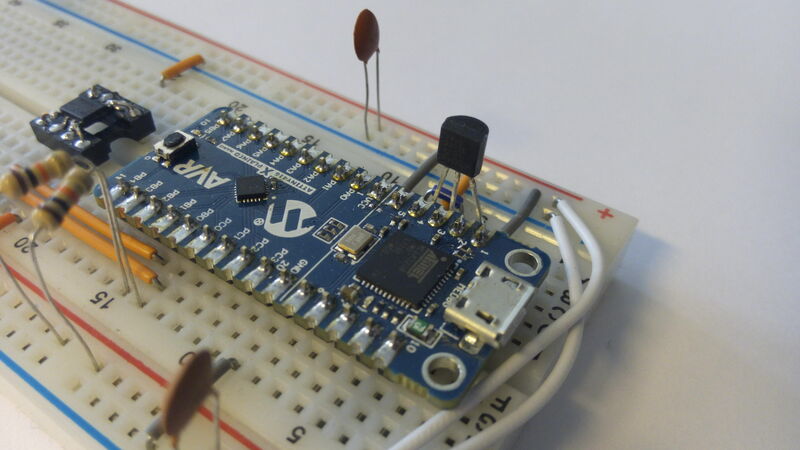 » XPLAINED 416 NANO board with ATtiny3216? XPLAINED 416 NANO board with ATtiny3216? I have ATtiny416 XPLAINED NANO boards and I love them. But it's a shame the board is populated with smallest uC from ATtiny__16 family with only 4kB memory. 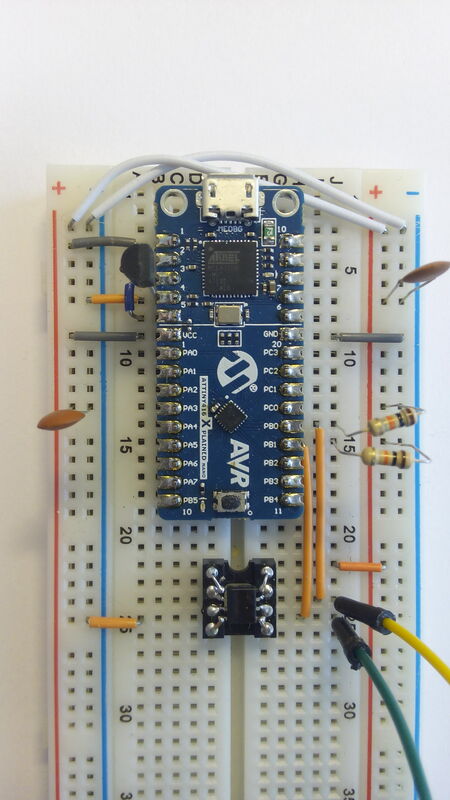 There's available ATtiny3216 which is pin compatible but has more memory and peripherals. Is it possible to use build-in board embedded debugger mEDBG to debug ATtiny3216 instead of ATtiny416? Similar debugger is on all XPLAINED boards. Have anyone tried to use it with other uC than provided on demo board? 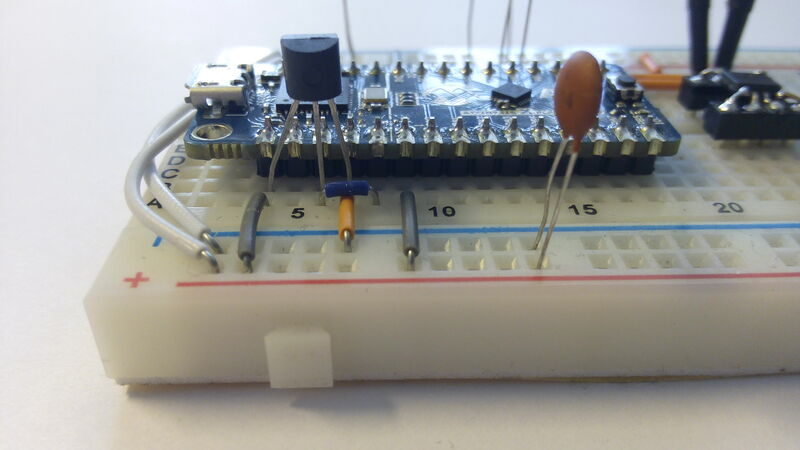 The onboard debugger can be completely disconnected from the ATtiny416 microcontroller and it can be used to program other UPDI devices. (3216-MFR is not available yet at my supplier's). ...which is probably the reason that the first available model in the family is on the demo board. '3216 appears to be made of Unobtanium at this point; the SO20 package is listed at a few distributors, but no stock anywhere. I should have written ATtiny1616-MFR. Then I realized there's also ATtiny1616-MNR for less than 1€. ATtiny3216 is available on TME but delivery time is 11 weeks and only SOIC package available. I wonder if Microchip is planning to release ATtiny6416 or ATtiny12816 then? :D :D :D They should have named them XMEGA because peripherals functionality and register coding style is more similar to XMEGA than to older ATtinys MCUs. I wonder if Microchip is planning to release ATtiny6416 or ATtiny12816 then? Not without some kind of architecture tweak. The current UPDI chips can only address up to 48k of flash. Most folks here are referring to these confusing new chips as "XTiny" in fact - you are right they are more "X" like, but they are also at the lower end of the X range so hence "tiny". And now, to add to the confusion, some chips of this family are "megas", like the ATMega4809. Obviously we can't call them xmegas, but xtiny is also confusing in this case. Well that's kind of Atmel (Microchip? )'s fault. The real error was to put "mega" in their names. Having said that, in the good old days the tiny / mega distinction was effectively whether the silicon had room for a MULtiplier so I guess even now any form of "tiny" would be wrong as I'm pretty sure all modern chips have MUL. Maybe it should have been AtXmidrange4809 or something? ATtiny3216 is available on TME but delivery time is 11 weeks and only SOIC package available. What is that -- an oxymoron? IMO it cannot be available -- and also not available. I do not consider 3 month theoretical lead time as "available". You kids probably don't remember Xmega introductions, "available now", and then no chips for common people for a year or two. 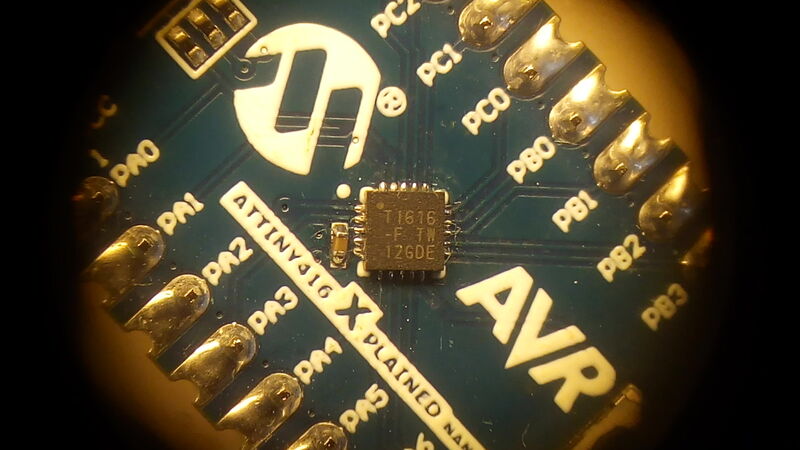 ATtiny1616 arrived! I've removed original ATtiny416 and soldered 1616. Everything works. If you want to perform this mod remember to remove sticker with serial number before desoldering with hot-ait - the sticker melts and smells. Additional test - if you want to power it from 3.3V whereas mEDBG chip is powered from 5V there's no problem. Just remove 0R resistor between VREG and VCC and wire a 1117-3.3 or something similar between VREG and VCC. We expected this to work in theory, but theory and practice not always match. Now we know for sure. You can also try this modification - originally the MCU is powered with 5V, but I wanted to lower the voltage to 3.3V. I desoldered a 0402 jumper near VCC pin and added my LDO (MCP1702-3302ET) on a breadboard. Everything works great.